For horror fans, Christmas has come three months early — in the form of the Nightmares Film Festival 2018 program, presenting 24 features and 164 shorts over the four-day event running Oct. 18-21 at Gateway Film Center in Columbus. True to its “#BetterHorror” motto, the program is jammed top to bottom with a mix of premier genre films from around the globe. Across the 188 films, there are dozens of world and North American premieres, a short accompanied by live in-theater music, projects from genre favorites, a Stephen King block and even a new documentary section. The features lineup is stacked with the world premieres of some of horror’s most anticipated new movies, including white-knuckle thriller The Final Interview from Fred Vogel (Toetag Pictures, August Underground); twisted kidnap nightmare The Bad Man from Scott Schirmer (Found, Harvest Lake); ‘80s-style horror anthology Skeletons in the Closet from Tony Wash (The Rake); and paranoia-fueled apocalypse tale Haven’s End from Chris Etheridge (Attack of the Morningside Monster). North American feature debuts include The Head from the director of ThanksKilling, about a medieval monster hunter; Christmas horror-comedy The Night Sitter; action-horror creature feature Book of Monsters; and mistaken-identity comedy-thriller Kill Ben Lyk. Horror legend Bill Lustig will open the festival with a brand new 4K restoration of his classic, Maniac. New cult director Jason Trost (The FP) will attend with The FP 2: Beats of Rage. Nightmares also continues its tradition of presenting one of the top genre shorts programs in the world. This year’s short films include horror, thriller, midnight and horror-comedy blocks playing throughout the festival. The festival also introduces its Recurring Nightmares section this year, a category that showcases the newest shorts by festival alums. The fest’s legendary Midnight Mindfuck block also returns. The section, called “one of the most dangerous and challenging programs at any festival” (The Film Coterie), will present Trauma, a harrowing tale grounded in the darkest parts of Chilean history, and La Puta es Ciega (The Whore is Blind), a surreal and violent exploration of the streets of Mexico. The 13 finalists in both the Nightmares short and feature screenplay competitions were also announced. The ultimate winner in each competition will be announced at the awards ceremony on Oct. 20. Nightmares begins Thursday, Oct. 18 at 7 p.m. and runs until Sunday night, Oct. 21. Fans who are ready to make the pilgrimage to Columbus, Ohio will find a limited number of passes still available for the festival at gatewayfilmcenter.org/NFF. 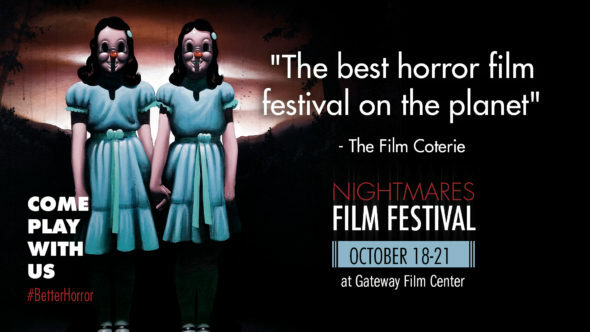 Hope Madden and George Wolf are proud to be among the jury panel for Nightmares Film Festival, one of the top horror film celebrations in the world. It has been the number-one rated genre film festival on submission platform FilmFreeway for 30 consecutive months. 2016 Oscar Nominations: Not Bad!